We’ve been reviewed by many of our guests and by major travel sites. If you’d like us to include your review here, please email us at info@travel-in.com.mx. Thanks! After our siesta in the shaded, beach-front hammocks, we went to our room and got ready for dinner. 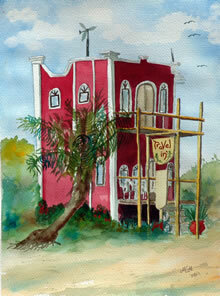 I had heard a lot of great reviews of a restaurant just up the road from Balamku called “Travel In”. Travel Inn is run by a Dutch couple and they make some downright awesome non-Mexican food. The night we went, there was only one other table occupied by two couples. Very quaint. It was raining outside, and when it got dark we felt like we were in one of the most remote locations in the world. It was an exciting feeling. We thought we were full (satisfechas) after the main meal, but then we noticed the other couples eating something that looked incredible and that we decided we had to try. It was scrumptious! 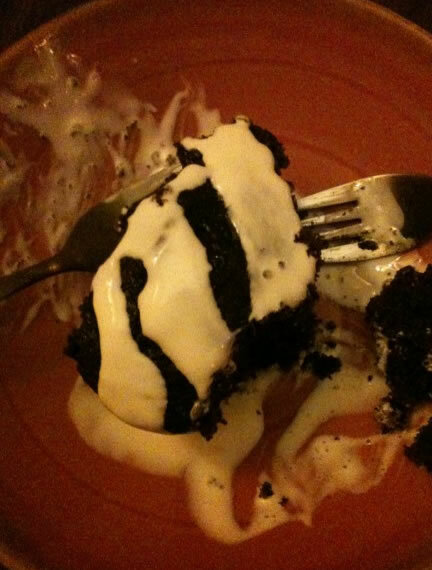 A thick, homemade chocolate cake with fresh cream pored over the top. Yum! Unfortunately, I forgot my camera when we went to eat at Travel In, so all of these photos are taken with my cell phone. Not the best photography, but it still looks good, though, right?! The last thing I have to say about our dinner/evening at Travel In, is that for some reason I kept having “Robinson Crusoe” images run through my head. Albert and Justa are wonderful hosts. Justa is a great chef and whipped together some great stuff for us. The spirits are inexpensive and the atmosphere wondeful. Travel In is Mahahual’s version of Cheers – everyone knows everyone and if you don’t, you get to know them in 10 minutes. 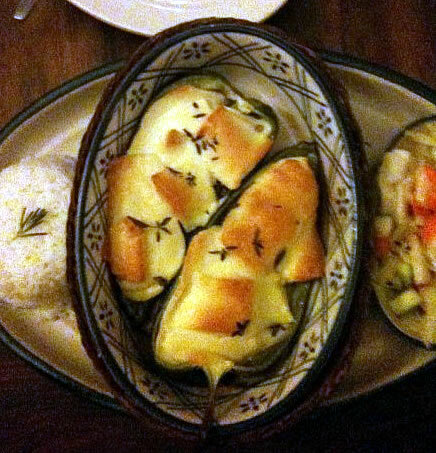 The baked fresh fish wrapped in banana leaves and the curried shrimp with rice is wonderful. 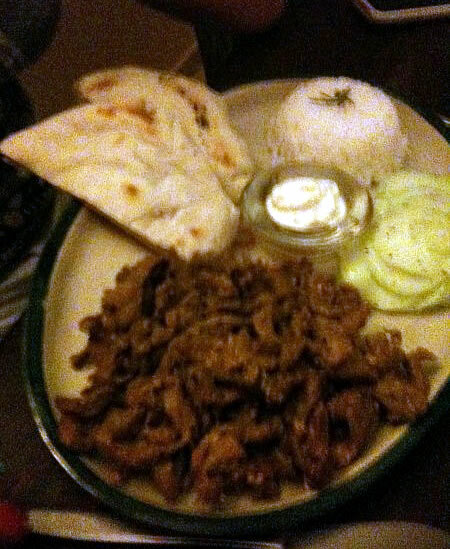 The garlic pita bread is great too. The meat in the meat fondue could use more marinating or spices – it was a tad bland. 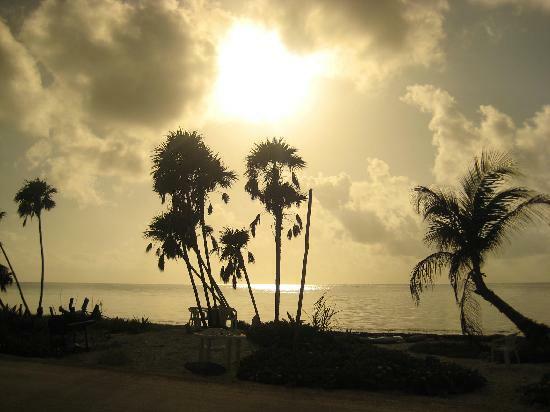 Overall – a wonderful experience and we were there probably 4 out of the 7 nights in Mahahual. We went to the Travel In’ several times over our 12-day stay in Mahahual. We went there our first night after first trying to go to Maya Luna after emailing them telling them we were coming that night. So off we headed back and went to the In’. It was actually rather busy and it took a little longer but after a few delicious margaritas we started to relax after a long day. The cheese pita’s were soooo good. My wife had the fish and I had the pork shwarma. We found out later it had not been that busy in weeks. The next Wednesday we returned for tapas and we weren’t disappointed. From the amazing bruschetta, swedish meatballs, curried bedeviled eggs, shrimp and poblano peppers it was so good! We returned the Saturday night of then tropical depression Alex watching the deteriorating weather and having another great time. Halfway through dinner a couple drove from town looking for dinner as most places had closed. We also met a lot of interesting people and chatted with the owners. It’s such a relaxed atmosphere you can’t get elsewhere. If you are going to the Costa Maya you have to visit the Travel In’! “Fantastic and varied international food”. “The inn of travelers dreams. 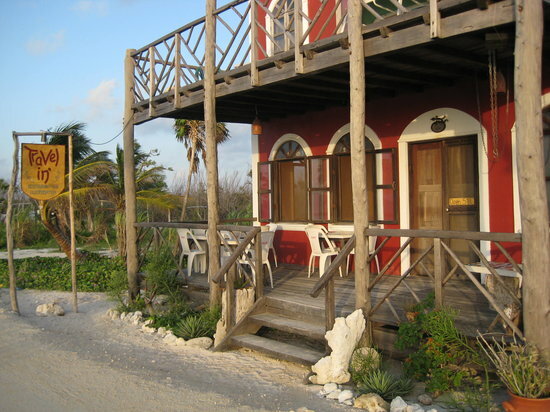 A tranquil, twinkling haven perched on the Costa Maya coast. International menu includes homemade breads, fresh fish, tapas on Wednesdays.”. 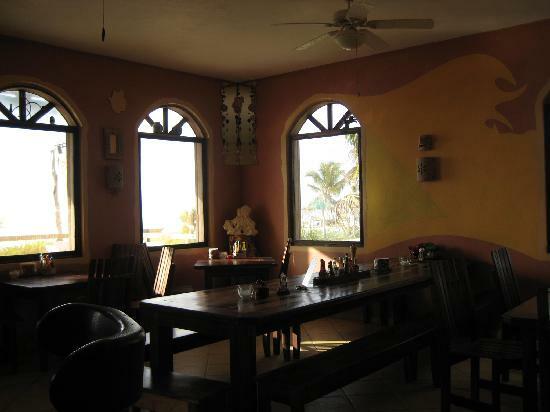 “A great little restaurant a few kilometers down the coastal road. Pita bread is baked fresh daily and makes for great sandwiches – hamburger, fish, BLT – as well as a curious but tasty “pita pizza.” The curry is popular here, and daily seafood specials vary according to the day’s catch and what’s available in town. Well worth the walk (or ride) down the coast.”.